In part two, I mentioned the blind spots of Fort Evans. 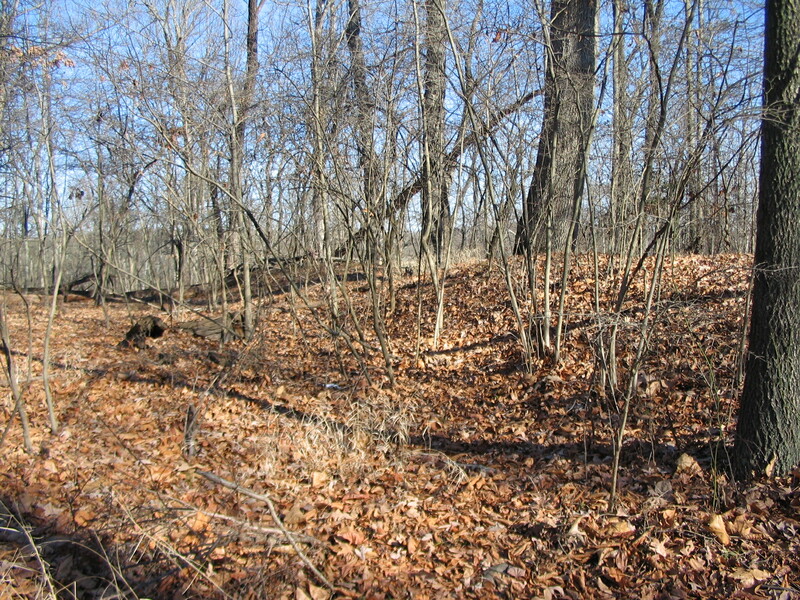 To the east, several ravines offered an attacker a concealed route to within musket range of the fort. While the elevation difference between Fort Evans and Edwards Ferry (the most likely landing point for any Union assault) is 200 feet, most of the drop of elevation is at the northwest bank of Goose Creek, where bluffs drop rather sharply. In between Goose Creek and Fort Evans, Cattail Branch and associated creeks cut through small valleys and ravines, ranging between 380 and 240 feet in elevation. The Branch itself winds down from Leesburg to the north of Fort Evans, crossing Edwards Ferry Road about 800 yards from Fort Evans, then passing down to Goose Creek to the east. In order to deflect any threat moving up from Edwards Ferry, the Confederates built a detached battery sometime in August or September, 1861. 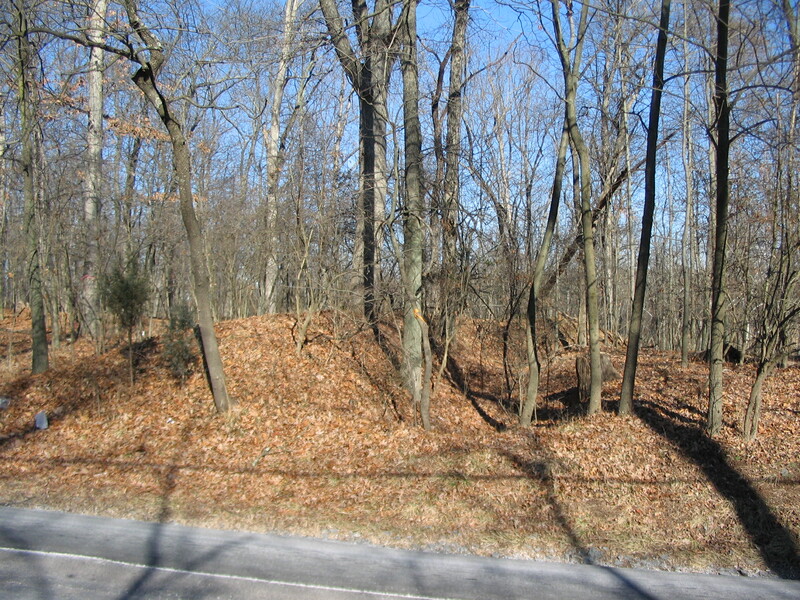 This fortification sat overlooking the point Edwards Ferry Road crosses Cattail Branch. The work was a simple linear fortification with a ditch to the front. Overall the line ran about 300 feet, north to south. A bastion formed on the north end of the line allowed a “refuse” to that flank, reinforced with a set of rifle pits. The southern end curved back with the terrain. The builders took advantage of a steep slope down to Cattail Branch, and did not build up the outer portions of the line beyond the ditch. 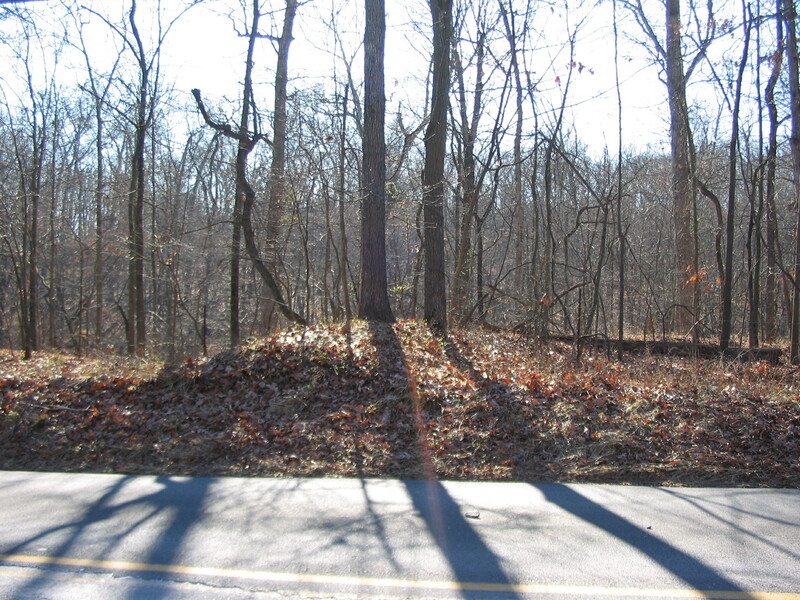 Most important, the position on the slope was not visible by an attacker until reaching Cattail Branch. For this reason the name “masked battery” was later applied to describe the works. 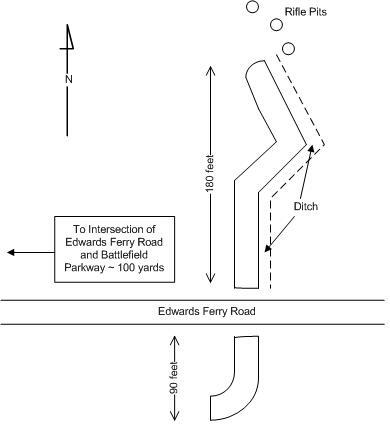 As depicted on the map, Edwards Ferry Road cuts through the work then continues about 100 yards to intersect with the modern day Battlefield Parkway. The entire portion of the works, both north and south, are on private property. However even in the summer with heavy foliage, the form of the walls and ditch are easy to spot while driving the public road. While the ground in front of the battery is posted and fenced, one can take in the formidable nature of the position by looking east on Edwards Ferry Road. The photo angle here does not do proper justice to the terrain. The road takes on the course of a “roller coaster” as it drops down and then ascends back up on the far side of the creek. On October 21, 1861, when Federal forces under the direction of Brig. Gen. Charles Stone made a crossing at Edwards Ferry in conjunction with crossings further north at Ball’s Bluff. As the reconnaissance at Ball’s Bluff evolved into a general engagement, the forces at Edwards Ferry were content to simply probe the Confederate defenses. 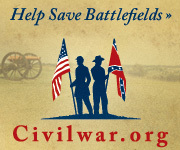 A detachment of the 3rd New York Cavalry under Major John Mix approached the masked battery location. The battery was manned by a section of the 1st Richmond Howitzers, probably consisting of a 6-pdr Field Gun and a 12-pdr Howitzer. No serious attempt to assault or otherwise test the Confederate position was made. The actions around Edwards Ferry and the fighting at Balls Bluff are well described in A Little Short of Boats: The Fights at Balls Bluff and Edwards Ferry, October 21-22, 1861, by James Morgan, III (Ft. Mitchell, Ky: Ironclad Publishing, 2004). Today the masked battery is the only fortification around Leesburg with any interpretation. Virginia State marker T-51 and a Civil War Trails marker stand near the intersection of Battlefield Parkway and Edwards Ferry Road. 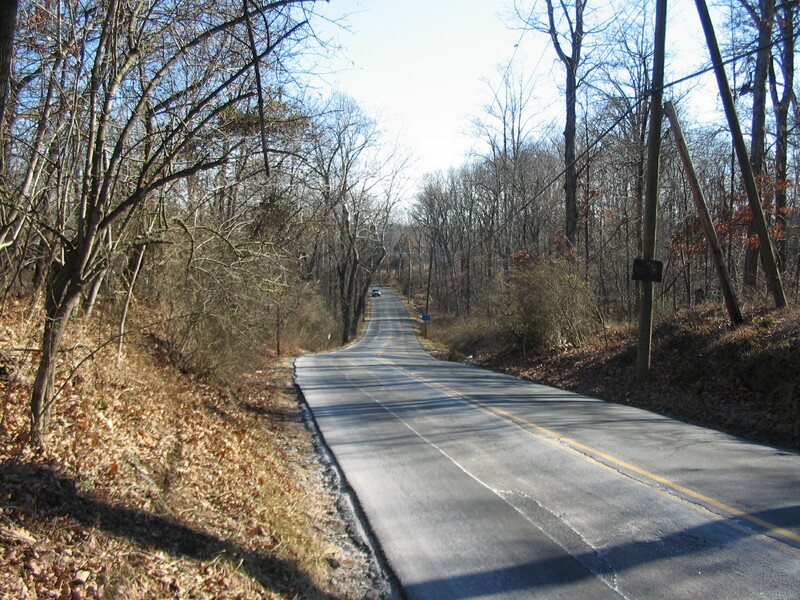 Expansion of Edwards Ferry Road in recent years did not directly damage the standing earthworks, but brought increased vehicle traffic. The location of the works on private property, however, does insulate it somewhat from further disruption. 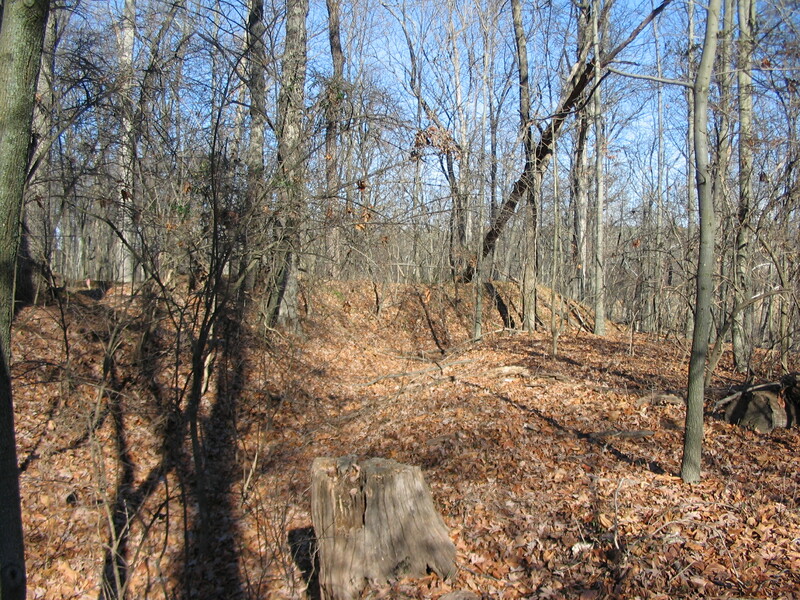 Placed in proper context, the Masked Battery is one of several sites related to the Battle of Balls Bluff which stand outside the bounds of the Regional Park. UPDATE: After some discussions with Jim Morgan, there are a few points from this entry that I’m going to refine to a finer point. Nothing major, but really more elaboration on my thoughts as to where the artillery was actually emplaced. To be blunt, I did not feel I should include speculations that might run directly contrary to some of the references I had consulted when writing the post. And lacking a proper walk of the works standing on private property, that speculation needed to be tabled. At any rate, I’ll expand on my speculations conerning the “real” Masked Battery after I’ve had the chance to examine the works up close to confirm or disprove a few things. Next time I’m in Leesburg with spare time I will check out this site, too. I guess the ruins of the canal and St. George Cooke’s house along Goose Creek north of Rt. 7 are not accessible to the public? Are you referring to the canal ruins down by Elizabeth Mills? On a history tour on the Potomac by canoe several years ago led by local historian John Phillips, we went up Goose Creek and stopped to view the remains of a house I believe on the east bank. IIRC, he said it was a house owned by Cooke. We also saw ruins of a canal near the creek. I believe all of these were on private land. There is an old mill on Goose Creek that was at one time owned by the Cooke family. It stood about a mile south of the modern Hwy 7 bridge over the creek, about at the south end of the golf course. Perhaps my memory fails me but I am sure the house and canal were both north of Rt 7 since we did not canoe under it. I think we made two stops, one for the house and another to look at a lock of the canal. There is a site north of the highway bridge known as Elizabeth Mills. It also has a set of locks. I’m not aware of the Cookes owning the location. But then again, there’s a lot I don’t know about the locality. Further downstream toward the Potomac is the last set of locks on Goose Creek, about a hundred to two hundred yards south of the Potomac. It is of course on the east side as you mentioned. But any dwellings there have been suplanted by golf courses. This site is where according to records my great great grandfather Middleton R. Kirby listed at when he got Thypoid fever and died. He was a corporal with the Company H of the 12th alabama Infantry. If anyone has more info on this please email me at Heavyduty053@aol.com.